There must be a hundred Virginia Beach oceanfront hotels. The resort area beach is lined with them from one end to the other. There are oceanfront hotels and motels a block off the beach. North end hotels and south end lodging. What are the nicest oceanfront hotels in Virginia Beach? Here are our suggestions for the best. Click on a hotel name for complete information. 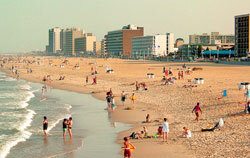 Click here for special deals on Virginia Beach hotels. The 20-story oceanfront Hilton hotel is designed to raise the standard for hotels in Virginia Beach. It features 295 luxurious rooms and suites with walkout balconies. Standard guest rooms feature impressive amenities highlighted by 32-inch flat screen televisions and high-speed Internet. Executive accommodations on the three top floors provide an even higher level of personal service and amenities. The Cavalier is an 18-acre resort with its own strip of private beach. The resort offers 2 buildings with 400 guestrooms including a variety of suites. Surrounded by expansive lawns and gardens, and features an indoor and outdoor Olympic size pool, 4 tennis courts (hard and clay), 5 restaurants, 2 lounges, and croquet lawn. The Cavalier on the Hill is a historic landmark built in the 1920s (one block back from the beach). The Cavalier on the Ocean is a more contemporary addition positioned on the beach. Everything you expect from Courtyard Marriott ... and the ocean! All 160 rooms have an oceanfront view and balcony. Beautiful tropical swimming pool with rock waterfalls, indoor pool, fitness room, room service, guest laundry facilities, free valet parking, and high speed Internet access. Located on the prestigious North End. The Courtyard Virginia Beach Oceanfront South is located in the center of the Virginia Beach resort area. All rooms are oceanfront with a private furnished balcony. Free high speed Internet access. Breakfast, lunch or dinner served in oceanfront restaurant and patio cafe. Heated indoor pool, whirlpool, exercise room. 2501 Atlantic Avenue. This relatively small oceanfront hotel is a real find. All rooms have oceanfront balconies or patios. It's not fancy or new, but it is clean and well maintained. Friendly staff. A real family atmosphere. Free continental breakfast. Free use of bicycles to ride on the boardwalk. 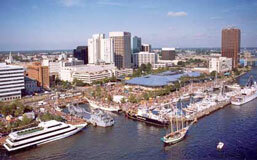 The Sheraton Oceanfront Hotel is a resort hotel on the exclusive northern end of the Virginia Beach boardwalk. The hotel is located approximately 15 blocks from the fishing pier and one mile from the lighthouse. Indoor/outdoor pool, restaurant, room service, and fitness center. 36th Street and Atlantic Avenue. Formerly the Comfort Inn Pacific Avenue, this hotel is now getting very good reviews as the La Quinta Inn & Suites Virginia Beach. Located one block from the beach and about 20 minutes from the Virginia Beach Amphitheater. The Founders Inn, centrally located to all the attractions of Virginia Beach, Norfolk and Williamsburg, is the perfect location for vacation getaways, business meetings and conferences. This Hampton Roads retreat features elegant restaurants, guest rooms, nearby golf and a variety of leisure activities set on 26 beautifully landscaped acres. 5641 Indian River Road.